The truth is there is room for both of you. Two wineries, nine bottles, one blend, four finished products. Argentinean wines were the stars around here last week. I participated in a virtual tasting with Santiago Achaval of Achaval-Ferrer and several others. I also opened a few single varietal wines from Rutini Wines. In this two-part post, I want to look at the approaches to winemaking, the vision behind the wines, and ideas for pairing. Achaval-Ferrer’s focus is on creating wines that best represent the terroir, wines that “move us to emotion.” Their vines are rooted in Mendoza and the wines are made to reflect that region. They believe in low-intervention winemaking: no cold soaks, no enzymes, no added sugar, sulfites. The vines are old and ungrafted, yielding fewer, more intense grapes. Quimera is a Malbec (50%)driven blend, rounded out by Cabernet Franc (24%), Merlot (16%), Cabernet Sauvignon (8%), and Petit Verdot (2%). What made this virtual tasting so unique and so interesting was that we were given each component to taste individually and in comparison with the final blend. We were able to hear from and question Achaval about his choices and motivation behind them. This gave each participant a better understanding about how each variety fares in Mendoza and the potential for, not only the grape, but the region as a whole. He describes the Cabernet Franc as , adding “velvety texture” to the Malbec. It is juicy, green, spicy and lush. The Cabernet Sauvignon is the bones, the structure. It is vibrant, a little tart in the finish. This is softened by the Malbec. On the bones, the Malbec provides the muscle, savory with round plum and spice. The Merlot is the “highest part of the poplar…dancing…uplifting.” It is round, soft fruit not noticeable mid-palate. Finally, the Petit Verdot provides the “glue” that brings all of the elements together. It is the roots, the basement, darkening the blend. Black fruit, floral, and chewy. Whenever six bottles of wine are to be opened, we need to bring in the reserves. This time, we invited my sister and her husband over. 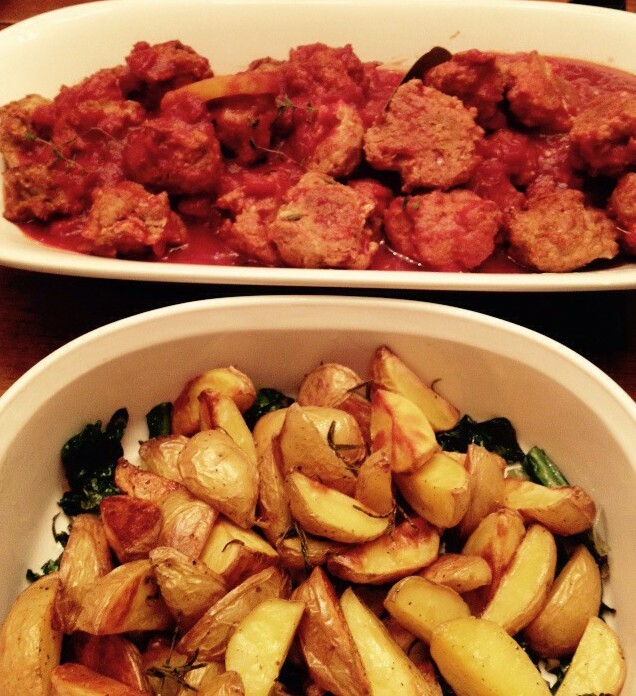 On the menu, Albondigas made with turkey chorizo served in a tomato based sauce with paprika, garlic, meyer lemon. Roasted potatoes with Swiss chard that I sautéed with shallot and sherry vinegar, arugula with sherry vinaigrette. It went very well with the wines. Our collective evaluation of the individual wines determined that Cabernet Franc was the winner followed by Malbec and Petit Verdot. I would love to see the Cabernet Franc introduced to the line. Quimera is blended before the final fermentation, allowing the wine to meld and grow as one. This wine is balanced, layered, inviting. It is vibrant fruit, mellowed by tannins, earth brightened by floral notes. It is youth tempered with wisdom, approachability with surprising depth. It is versatile and would be a welcome guest at any dinner party. 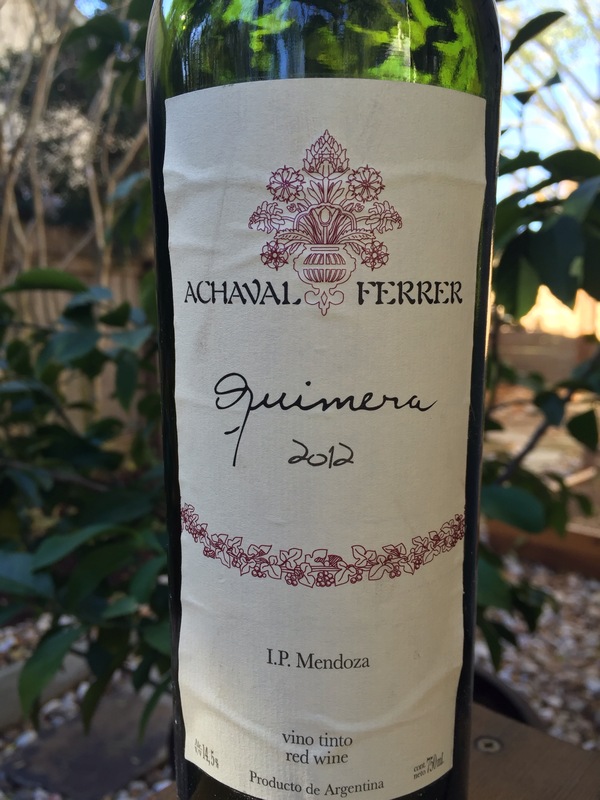 The 2012 Achaval-Ferrer Quimera is the most recent release and retails for $35. Many thanks to Santiago Achaval for sharing his passion for the wine and his country. Thank you Patricia Clough of Gregory White PR for the invitation and for arranging this tasting. I still have a few bottles of Quimera, I think from 2008 vintage. Delicious wine. Achaval-Ferrer crafts oustanding wines across the board. If you get a chance you must try their terroir series Malbecs. Best malbecs I have ever had! http://rockinredblog.com/2015/10/07/achaval-ferrer-crafting-premium-malbecs-in-mendoza/ Cheers! I purchased a case of the ’05 Quimera at auction last year. It is a very special wine. Your description of the component parts is great and we can learn a lot from understanding the blend. Too bad that we don’t often get the chance. Agreed. So informative and interesting. A real treat! I would imagine that case is drinking beautifully!